360 year old inn closes its doors. Sad news I found today about the closing of a famous and traditional Japanese inn. It dates way back to the Edo period and is even in the famous 53 Stages of the Tokaido by Hiroshige. I wish I had the money to buy this, to preserve the history and its legacy alive. Story is by Yoshinobu Matsunaga of the Asahi Shimbun. 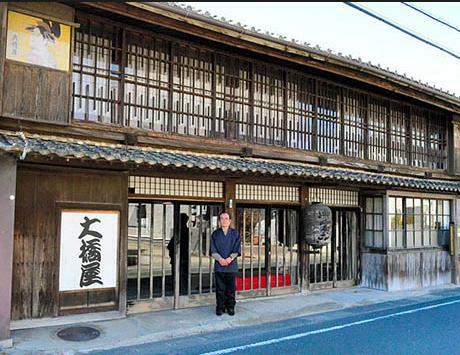 TOYOKAWA, Aichi Prefecture–After more than three centuries of welcoming wayfarers, a traditional inn here that has been celebrated in haiku and ukiyo-e art of the Edo Period (1603-1867) will finally close to guests on March 15. “We have managed to remain open until now because we have been supported by many people,” said Kazuhiro Aoki, 75, the 19th-generation owner of the Ohashiya inn. The inn played an important role when Akasaka, where it is located, was one of the post towns along the old Tokaido road that stretched from Edo to Kyoto. Among the many guests that have found lodging at the inn were famed haiku poet Matsuo Basho (1644-1694) and ukiyo-e artist Ando Hiroshige (1797-1858). The Ohashiya is built in the traditional architectural style of the “hatago,” the Edo Period equivalent of today’s motel where travelers along the old Tokaido road rested their weary feet. Aoki will donate the inn to the Toyokawa city government, which purchased the plot of land measuring approximately 700 square meters on which it stands. The city government plans to set aside about 46 million yen ($386,000) in the fiscal 2015 budget to preserve the building so it can be opened to the public probably from 2016. The Ohashiya started operations in 1649, with the present structure erected in 1715. Guests climb a shiny black wooden stairwell to reach the second-floor rooms, which have window latticework and eaves constructed in the traditional Edo Period style. 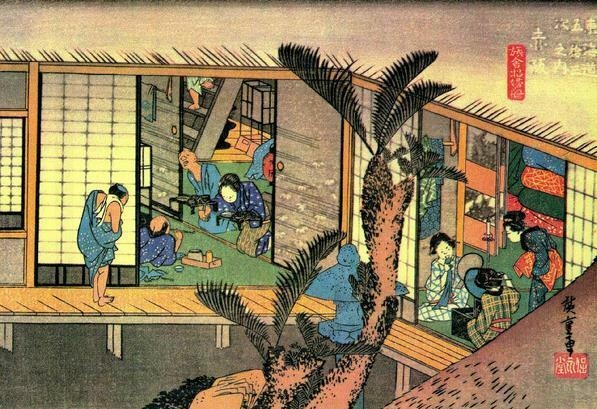 The inn was included in the famed Akasaka post town ukiyo-e work by Hiroshige, which was part of his series of paintings on the 53 stations of the Tokaido road. In 1977, the inn was designated as a cultural asset by the former town government, which has since merged into Toyokawa city. During the Meiji Era (1868-1912), there were especially busy times for the Ohashiya when as many as 100 guests would stay in the 27 rooms then in use. However, in 1921, a fire that started in a neighboring home spread to the Ohashiya and destroyed one-third of the building. Despite that conflagration, the inn remained in business. In recent years, Aoki and his wife, Noriko, 69, limited their accommodations to three groups a day. The Aokis decided to close the inn because of the declining number of guests and because their advanced age made it increasingly difficult for them to operate the accommodations. As regular guests who have heard about Ohashiya’s closing have called to make reservations, most nights until March 14 are fully booked. The Ohashiya is post number 37 from Hiroshige’s 53 Stages of the Tokiado Ukiyo-E series. Previous Post The Throw Away Temple – Dumping Ground of the Yoshiwara Prostitutes.